Papaya, commonly known as papaw or pawpaw, is a delicious fruit with a wide range of health benefits. It is reputably called the “fruit of angels” and the “tree of life”. It is rich in vitamin C, antioxidants, and nutrients, and this fruit has numerous benefits to offer for your skin. Papaya is also an excellent source of folate and a good source of potassium and fiber. In addition, papaya contains the carotenoids, lutein, zeaxanthin, and lycopene, which have been shown to protect the eyes from free-radical damage, and lower the incidence of many cancers. It has many great health benefits, but it’s also used extensively in beauty products and is known to give a healthy glow. Papaya Benefits For Skin Often people consume papaya when it’s ripe. Since enzyme levels decline as papaya ripens, it is better to consume raw papaya when it is still green to retain all its enzymatic qualities. Raw Papaya Benefits For Skin Heals injuries and skin conditions Raw papaya has rich protease enzyme content. This enzyme helps a wound heal faster. Also, it contains vital nutrients such as vitamin A, E, B, and C, potassium, and magnesium which help in fighting the infections. Treats ringworms Raw papaya treats ringworms. Rub a few slices of raw papaya on the ringworm patches to reduce the inflammation. Ripe Papaya Benefits Acts as an Anti-Aging Agent Eating a papaya daily will help you look younger and keep your skin healthy. 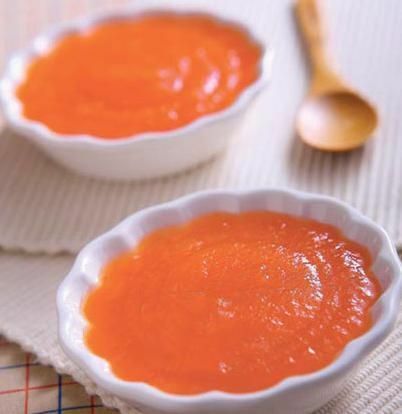 Antioxidants like beta-carotene prevents free radical damage and delay the aging process. This keeps the wrinkles and other signs of ageing at bay. Fights Skin Problems Papaya is beneficial against pimples, scars, acne, and other skin infections. Helps Achieve Blemish-Free Glowing Skin Fresh papayas possess dead cell dissolving abilities that helps you achieve a perfect glowing skin. 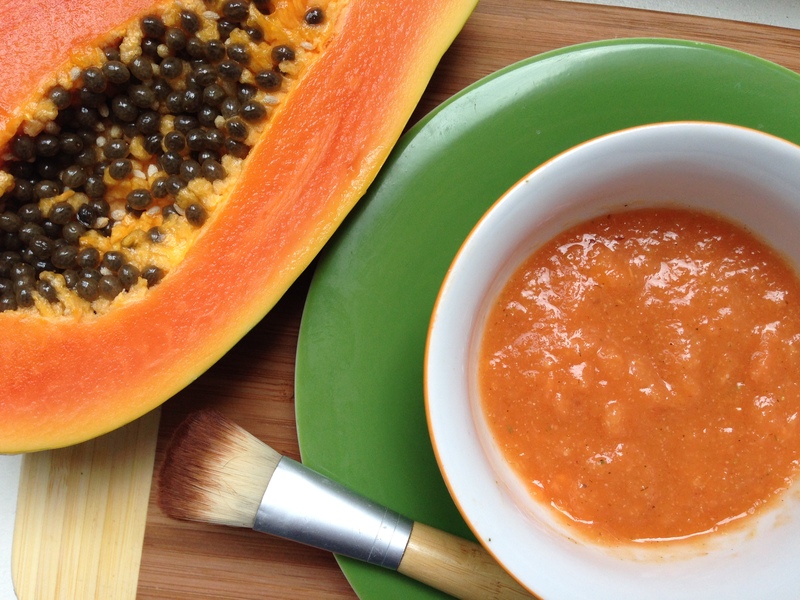 You can also use papaya in your face masks to get healthy, glowing skin. Health Benefits Of Papaya Leaf Juice For Skin Papaya leaf juice is the juice extracted from the leaves of papaya plant. Recent studies have shown that papaya leaf juice has benefits skin in various ways and enhances the quality and health of your skin. Cleanses Your Skin You can use papaya leaf juice as an effective cleansing agent. The karpain compounds in it have the property to inhibit micro-organisms and all other kinds of toxins. As such, it makes your skin clear and clean. Pimples, blemishes, freckles, and all other such skin problems are effectively fought against. Treats Eczema Eczema is effectively treated using papaya leaf juice. Take the juice from papaya leaves and use it to apply over the affected areas. Make sure you scrub your skin well before applying. 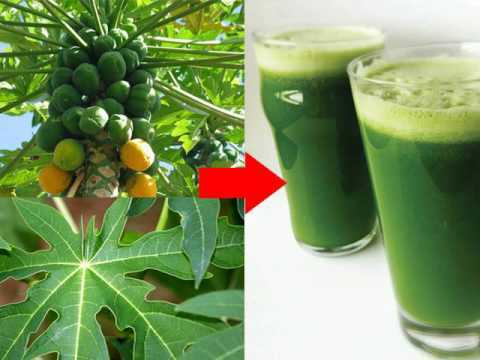 Heals Open Wounds And Sores Open wounds and sore can be treated using fresh papaya leaf juice. Makes Skin Softer To make hardened skin soft, you can use papaya leaf extract. Take the milky juice which is extracted from the tip of the papaya leaves for this purpose. Prevents Discoloration Applying papaya prevents discoloration of skin. The peel of papaya helps in whitening legs. Papaya Juice Benefits for Skin Papaya juice is smooth with a creamy texture which provides an amazing experience for palate, while providing healthy dose of nutrients and minerals like calcium, chlorine, iron, phosphorus, potassium etc. 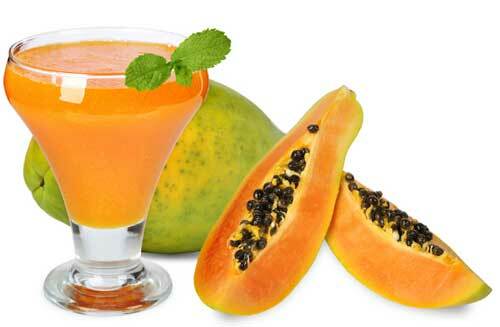 There are many benefits of Papaya juice, also known as pawpaw juice, and it is particularly useful in curing diseases related to blood, constipation, and heart. 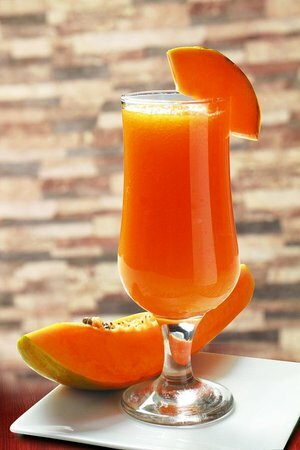 Per calorie, papaya juice contains as much vitamin C as oranges; one cup, or 55 calories, has 144% of your daily need of vitamin C and 31% of vitamin A. Scrubs Dead Skin Cells It is a great source of vitamin A and Papain, which help in removing dead skin cells and also breaks down the inactive proteins. Hydrates Skin The property of “Low Sodium Quality” helps keep your skin hydrated. 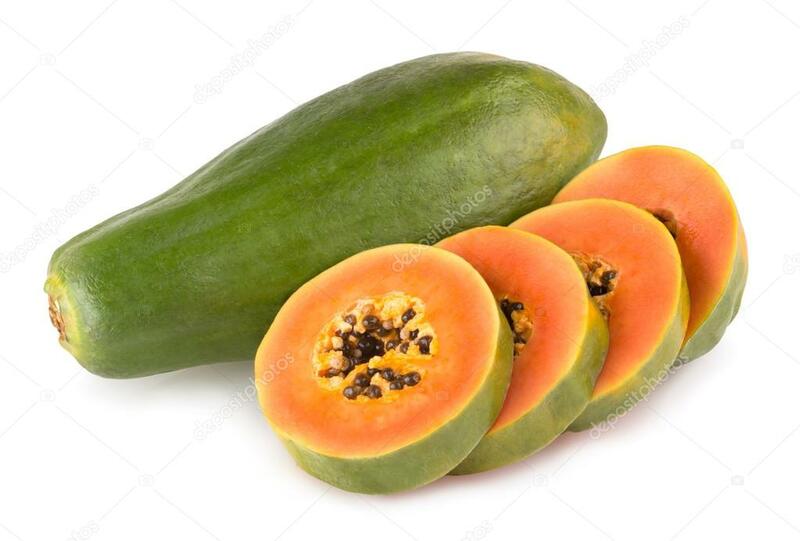 All the skin types can draw benefits from eating papaya; however papaya especially unripe green ones should be avoided in pregnancy as they can induce abortion or premature delivery (studies available). Oily Skin Types: Can add multani mitti (Fuller’s earth) or clay to mashed papaya to help absorb the oil along with other ingredients. 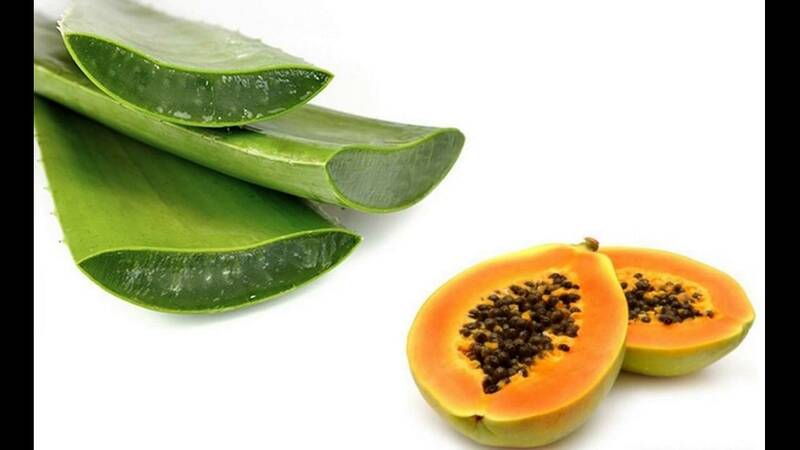 Dry Skin Types: Can use the pulp alone or with aloe vera, honey, rose water etc. 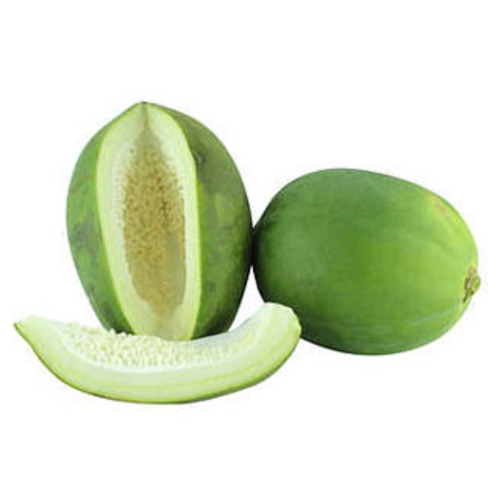 Non- Sensitive Skin Types: Should prefer unripe green papaya because of higher papain content but ought to do a patch test before using it for the first time. Sensitive Skin Types: Should avoid unripe green papaya as it has higher concentration of latex in addition to papain which might increase the chances of allergy and irritation. Patch test is highly recommended. Pigmented Skin Type: Can use papaya face pack and scrub to lighten the skin of face and body.